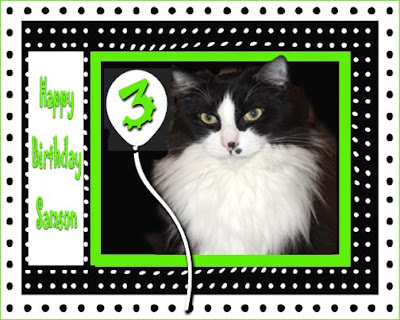 The Monkeys: Samson is Three! 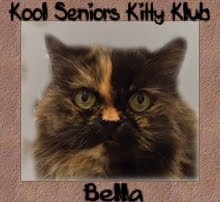 I'm three years old just like Delilah and Mommy (except Mommy has a 4 in front of her 3)!! We had such a party! Jane and Alice from The Casbah Kitten sent me this amazing fat penguin! Thank you, girls! I LOVE it! Mischa and Pasha gave me this cool furry snake and treats! Thank you! Deli got me these skulls! She wanted me to open the package right away so we could play together! Mommy got me the big pickle! Guess what The Ball Guy bought me? Yep, a ball. I should of figured that. I'm the luckiest cat in the world! I hope I turn 3 again next year. I have so many toys, I don't know where to start! All my friends are welcome to come by for treats and toys! Being 3 is awesome! Wishing you a great Birthday! You are so lucky, you got so many gifts. I will like to go over your house next year for your Birthday! Have a great day Samson! Happy birthday Samson! You got lots of wonderful presents! Great penguin! The great thing about birthdays is that they come every year! But that can be both a blessing and sad.... we get smarter but older! Thanks for inviting me and others for some treats and toys! happy birthday samson! what wonderful presents you've received! you are truly loved! Happy Birthday from all of us here, dearest Samson. It sounds like becoming three is mighty cool. Pawsome presents you got there. Enjoy your day! Happy Birthday, Samson!!! We hope you have a great day with all your presents!! Look at all those great gifts you got! Wow! We are on our way over to play wif you! Happy Birthday, Samson! Looks like you got some great gifts!! If ya send any of em to Dallas.... :) Enjoy!! Happy Birthday Samson! What wonderful gifts. Guess what, you don't need to be 3 again next year, because being 4 is even more awesome! Have a lovely fun filled day! You have gotten such wonderful presents. Enjoy your special day!!! Happy Birthday Samson! You got lots of great gifts on your birthday and you even got Temptations! What a great day! We hope you have a wonderful birthday and many, many more! Angel turns 3 next week and now she's really looking forward to it! Happy, Happy, Happy Purrthday Samson -- there's a happy for each year of your life! And we hope it keeps on being just as happy efurry year from hereon in! Happy Birthday, Samson! You deserve all those gifts and more! We are wishing you many happy returns. Happy Birthday, Samson! You got lots of loot! Whitey wishes me wuz 3! HAPPY BIRTHDAY, SAMSON......what a wonderful day you are having....aren't birthdays fun??? We hope you will drop by and see your card. 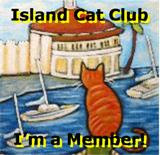 Samson, you should enter Boris Kitty's birthday picture contest! Happy Birfday Samson!!!! You got cool toys...I wonder when I'll turn 3? I want cool toys, too! You got some great presents! You got some pawsome gifts! Hope you had a very Happy Birthday! Happy birthday, Samson! I hope you have an extra-special day! Oh wow, happy purrthday!! Those are great purrthday presents. I'm 3 years old too. It's a good age to be. Hi, it's me again! I've done some LOLs of Samson, and some of Dylan because they share this birthday. 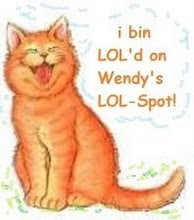 So check in at the LOLSpot to take a look! Happy Birthday,Samson! It's great to be three. You really got some nice prezzies. 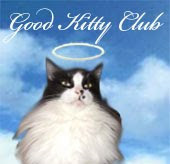 Better than that, you've really got some nice furriends. Thanks for inviting me to your party. Happy purrfday Samson. You are a lucky mancat to get so many gifts. We hope you had a great day. Happy happy birthday, Samson!! We're delighted you got so many cool toys for your birthday. Thanks for the party invite, we're on our way with more treats to add to the stash! Happy Birthday, Samson! We're so excited for you! What a wonderful cache of presents you got:) Here's a song just for you. WE HEARD IT WAS YOUR BIRTHDAY AND WANTED TO COME AND VISIT. SAM & ANDY TOLD uSSSSS!!! Happy Birthday Samson! What a nice bunch of gifts you got! I'll come right over and play with you and Delilah! Happy birthday, Samson! Hope it was a special day. Happy Birthday Samson!! Three is a great age to be. Keep the celebration going all week...we'll be there soon!! Happy Belated 3rd Birthday Samson and many, many, many moooooore!! We love all the cool gifts you got!! Enjoy playing with them! 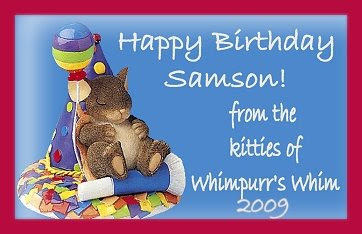 Oh Samson I can't belive I missed wishing you a Happy Birthday on your actual birthday! But I do want to wish you a belated Happy Birthday! It looks like you had some great presents and a great day! !